Milo & Bethany Curtis, parents at Grace, have a blog where they share about their lives. They recently posted a story about one of the ways they helped their daughter learn about stewardship. I thought it was a great idea, and there’s even a video. I was watching Shark Tank the other day, the show where really rich people listen to regular people pitch business ideas and ask them to invest in those ideas. Often the ideas are crazy, and the ‘sharks’ just laugh them out, but sometimes the sharks fight over the business idea. One of the fought over ideas this particular episode showed was a lady who started an online toy swapping business called Toygaroo. Calling themselves the ‘netflix’ of toys, Toygaroo allows you to swap out toys every other month! You can choose which toys you’d like to have, dependent on your age of kids, and how long you’d like to keep them. Once your kids are ready for new toys, you just ship the box back and they’ll send you more…free shipping included in your monthly fee. I also heard about this idea being applied to clothes on a site called ThredUp. This site allows you to list your own boxes of clothes and swap them for someone else’s box of clothes (all in good condition, of course). And it’s only $5 (plus shipping) per box. What a great way to get ‘new to you’ clothes for your kids without breaking the bank! In a time when most people are looking for ways to save money, these websites are a great way to help out! Do you ever struggle with too many distractions in your life? Does this keep you from finding quiet time alone with God? Do your distractions (kids, jobs, spouses, etc.) keep you from always putting God first in your life? This is something I have been struggling with lately. I feel there are days when it seems as though God just gets the “leftovers” in my life. If I am being truly honest, most days I would say that my kids are taking that first spot on my priority list and it seems that God moves further down the list. Having small children can be exhausting but it’s no excuse not to stay focused on God first. In fact, I should be turning to God even more for strength and asking the Holy Spirit to lead and guide me every moment of the day. Our Life Group has been going through the book “Crazy Love” by Francis Chan. This book has really convicted me in these areas of my life. In the book Francis states “Our God is Holy and He deserves excellence. Some people protest that something is better than nothing! Is it really? Does anyone enjoy token praise? I’d rather you not say anything than compliment me out of obligation or guilt. Why would we think God is any different?” Being a follower of Christ, a true disciple, cannot be done halfheartedly or by giving God our “leftovers”. God must be the central to everything in our lives, not just what we pick and chose. I know I struggle with giving God my best. Some areas I want to hang onto & make my own plans for (such as money and my kids’ future), and God gets the leftovers. But giving God my best (my all) requires allowing the Holy Spirit to work in me, transforming my life. Francis states in his book that “many of us believe we have as much God as we want right now, a reasonable portion of God among all the other things in our lives.” He states “most of our thoughts are centered on the money we want to make, the school we want to attend, the body we aspire to have, the spouse we want to marry & the kind of person we want to become. I definitely get caught up in this. My focus too many times is on the here and now instead of having an eternal perspective and it scares me sometimes. Nothing in life should concern us more than our relationship with God. So why is it so hard to let go of everything else & focus on the only one who really matters? This world distracts us with so many things and sometimes it can be easy to get caught up in it all. God is so much bigger than all of this and He wants us to put our hope and our trust in Him. God wants our best and He deserves our best!! These are the questions Francis asks in his book and should be asked by all of Christ’s disciples: Are you willing to say to God that he can have whatever he wants? Do you believe that wholehearted commitment to Him is more important than any other thing or person in your life? Do you know that nothing you do in this life will ever matter, unless it is about loving God and loving the people He has made? These are tough questions but if we can honestly say yes to all of them, then we will know that we are giving God our best and not just our leftovers. Thank you Lord for Your unconditional love and amazing grace. I wanted to share with you something that I have struggled with for a number of years, and am just now learning that there can be freedom in it. For so many years I have thought that I could and would never change; this was just a part of me and who I am. The Lord has been showing me that I need to believe his Word when he says I am a new creature the old has gone. I have a tendency to worry about life and the circumstances that are presented to me. So much so that over the years it has become a serious health issue in my life. It has affected my joy in life as well as manifested in negative physical ailments. I have tried the medication route to no avail, and had resolved that this was just going to be a part of my life. The Lord has been teaching me through much push back on my part that He does not want me to suffer in this. His grace is sufficient for me. I have been learning that the enemy has taken my thought process and has fed me lies that I have believed over the truth of who I am in Christ. The Lord has asked me to stand up and fight and to ask others in my life to stand with me. I now go to Mike, my husband, with any negative thought or false belief throughout the day and ask him to pray for me. I need him to stand in the gap for me as my husband and the leader of our home. I love small devotional books and one that I have been reading summed up what the Lord is teaching me. The book is called “Dear Jesus” by Sarah Young. I definitely have not arrived, and know that I will continue to need to trust in the Lord daily to overcome this. I hope this is encouraging for you that the Lord has a great plan for each of us. We have to make it a priority to bathe ourselves in communion with our Father every time a false belief is presented to us. We also have to believe that the Lord knows what’s best for us, and trust Him in the process. His destiny for you and me is to be victorious. I recently came across a blog post over at www.Incourage.me from Tsh Oxenreider of Simple Mom. She illustrates the life of a parent so flawlessly and I could relate to what she had to say. It was a good reminder and I was encouraged by it, so I thought you might enjoy it too. When I was growing up, there were certain things my dad and I shared. The one that sticks out the most in my memory is our shared love of basketball. After a one year stint as a cheerleader at the age of 5, I knew that being in the game, not in a dress on the sidelines, was for me. Playing basketball, even at the young age of 6, was a way for my dad and I to connect. He was my coach for many of the early years and after each game we’d hash over what went well, what didn’t, and what we should work on at next practice. As the years went on, I was never the best player on the team, but having my dad be there to encourage me and talk through the strategies was such a highlight! 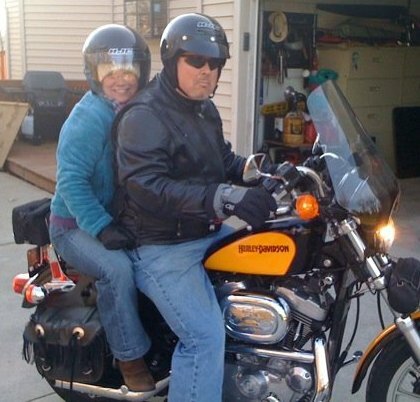 Me, my Dad, and his Harley, taking me on my first ride! In a world with so many broken families and girls with absent fathers, I look back on my chidhood and am so grateful for the time spent with my dad. My dad was the one who baptized me when I fully understood what a relationship in Christ was. I inherited the logical, practical, figure-it-out part of my personality from him. When I moved out to Oregon from Michigan, he took time off work to drive out with me. We still have fun conversations about our favorite TV shows, and I know I can call him anytime for advice on how to ‘fix’ almost anything. I hear stories from many friends on how they are intentional as dad’s; taking their daughters out on dates, getting involved in their sporting events, or finding a common point of interest to relate with their daughter. I love hearing these stories because I know girls need their fathers to be positive role models in their lives. So Dads, what are you doing to be intentional in your daughter’s lives? How are you being that positive role model of a godly Christian man that every girl needs in their lives? If you’re a single mom with daughters, how are you allowing positive Christian male role models into their lives? I’d love to hear ideas of what’s going well to pass on to those who may have more of a struggle! Do you appreciate all the Kidventure teachers? They love spending time with your children, teaching them about Jesus, rocking the babies, encouraging all ages, and just having fun on Sunday morning. We don’t just provide a ‘babysitting’ service in Kidventure, but a very intentional atmosphere of caring and teaching. We want your children to know they are valued and not only does Jesus love them, but so do their teachers. 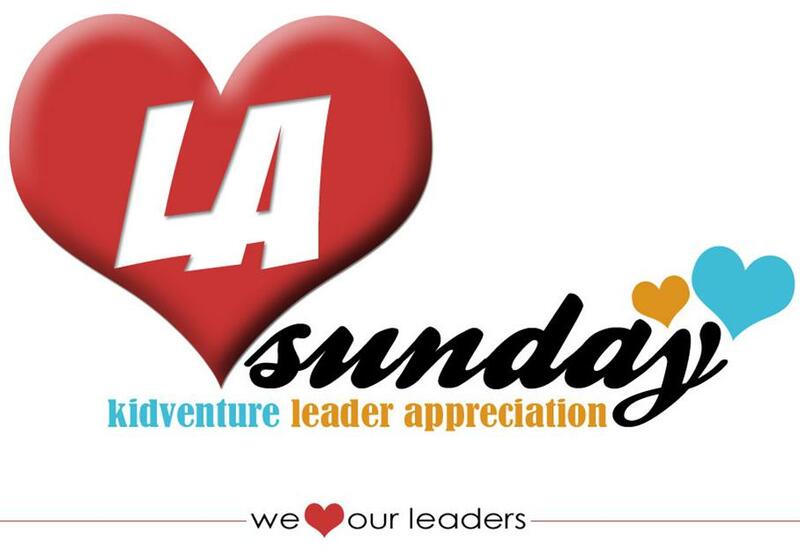 This Sunday (February 20th) is Leader Appreciation (LA) Sunday. Every few months we take the time to highlight our Kidventure leaders and let them know they are loved. Can you help us out? When you drop your child off, take an extra couple seconds and just ecourage the teacher of the classroom. Let them know you appreciate the time and energy they put into loving on your kids. Maybe give them a hug, or a quick high-five, or a few simple words! Thank you for letting us serve your kids!